Which buses can I take to get from the Hong Kong airport to 36-44 Nathan Rd, Tsim Sha Tsui, Hong Kong? Which ones are the most convenient in terms of the proximity of the destination bus stop and/or fare? (If that matters, I plan to take the bus around 7-8PM). Red circle indicates where 36-44 Nathan Road is. From airport, walk to the bus terminus to town. It's to the very right of arrival hall after immigration and customs. Take Bus Route A21 towards Hung Hom MTR Station and get off at Middle Road stop (circled blue). Then walk back a block. A21 belongs to a series of bus routes dedicated for airport connection. Its fleet of buses comes with luggage rack. The bus trip costs HKD$33. Prepare exact fare or use an Octopus Card. I recommend against taking the MTR (except Airport Express) with heavy luggages. A bag or two is fine; taking MTR with heavy luggages in evening rush hour is asking for trouble. Bus S1 ($3.5) to Tung Chung MTR Station; MTR Tung Chung Line to Lai King; (walk across opposite platform for) MTR Tsuen Wan Line to Tsim Sha Tsui. 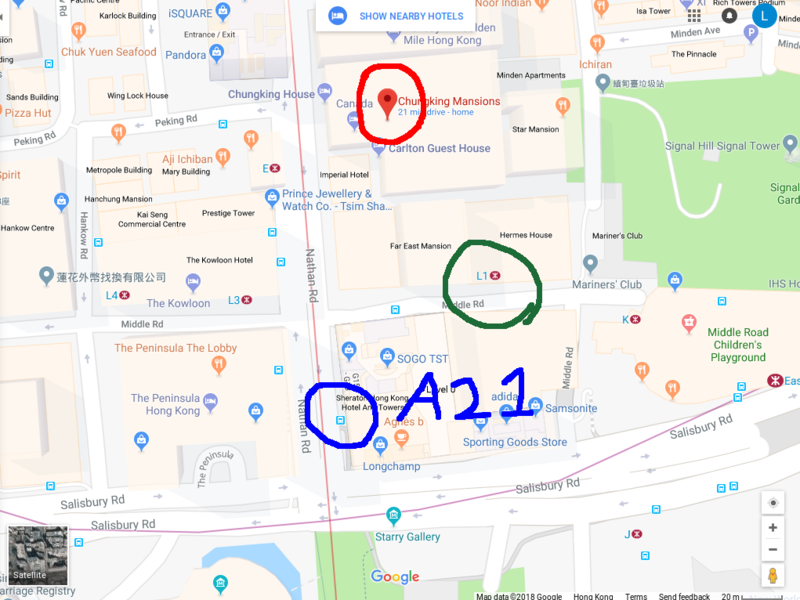 ($16.9 for Octopus Card; $19.5 for Single Journey Ticket) Exit L1 of Tsim Sha Tsui/East Tsim Sha Tsui Station (green circle in map) is around the corner of your destination. Another option would be to take the Airport Express to Kowloon and take the complimentary shuttle bus to TST. There are three such buses, K3, K4 and K5, for different parts of TST (because it's a busy and crowded region). Find out which one goes closest to your destination: bus info. Unless you absolutely need to take a bus, the best path is by the MTR. Take the Airport Express to Hong Kong. Walk to Central (it is a relatively long walk, but all indoors with moving walkways). Take the Tsuan Wan Line to Tsim Sha Tsui. Not the answer you're looking for? Browse other questions tagged airport-transfer buses hong-kong hkg or ask your own question.